As he has for possibly more than four decades, the trumpeter swan nicknamed Solo returned Monday to the year's first big patch of ice-free water at Turnbull National Wildlife Refuge. This time, however, he didn't return alone. Solo was joined by the mate he found last year and three of the four cygnets they produced at the refuge last spring. U.S. Fish and Wildlife Service staffers do not know where Solo winters, but each year he returns to the refuge within a day or two after one of the ponds near the headquarters thaws just enough for a 30-pound trumpeter with an 8-foot wingspan to land and take off. Solo's return ends speculation that the iconic old bird of Turnbull might have been the trumpeter shot on Dec. 28 on the Colville River. As he has for possibly more than four decades, the trumpeter swan nicknamed Solo returned Monday to the year’s first big patch of ice-free water at Turnbull National Wildlife Refuge. This time, however, he didn’t return alone. Solo was joined by the mate he found last year and three of the four cygnets they produced at the refuge last spring. Solo’s return ends speculation that the iconic old bird of Turnbull might have been the trumpeter shot on Dec. 28 on the Colville River. “It’s unfortunate that one or two swans were killed at Colville, but we are relieved it wasn’t the Turnbull swans,” said Mike Rule, Turnbull wildlife biologist. Rule decided not to put leg bands or collars on Solo and his family last year because he didn’t want to add stress that could cause the geriatric bird’s demise. A normal lifespan for a trumpeter swan is 20-30 years. Stevens County residents and birdwatchers around the region quickly assembled a $2,000 reward for tips that might help Washington Fish and Wildlife Department officers arrest whoever shot at least one of a group of trumpeters that had been hanging out on the Colville River, three miles west of Colville. Trumpeter swans are a protected species. Local birdwatchers say only a few have been recorded in this region during winter. The case remains under investigation, said Madonna Luers, spokeswoman for the state Fish and Wildlife Department. 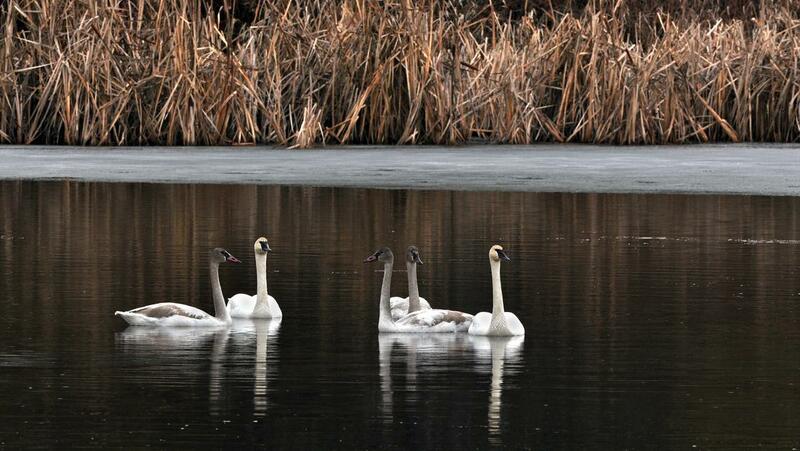 Three swans had been seen on the Colville River on Dec. 28. A resident reported hearing shots. A wildlife officer responded and euthanized one mortally wounded adult swan. A lone swan has been reported several times since then on the Colville River near its confluence with Lake Roosevelt, adding to speculation that two trumpeters may have been shot. Meanwhile, Turnbull staff members were all smiles Monday, even though one cygnet is missing. Solo’s brood of four hatched on Father’s Day, the first trumpeter brood at Turnbull in 21 years. They fledged around the first week of October. “In the fall, the female would take the cygnets up and fly off; then about five minutes later, Solo would come by honking like crazy looking for them,” Rule said. Later, the whole family would come back to Turnbull as though he’d rounded them up like a herd bull, Rule said. One of the cygnets had disappeared and probably perished during a flight before Thanksgiving, when ice-up forced them out of the refuge for winter. Solo and his first mate raised Turnbull’s last brood of trumpeter cygnets in 1987. Solo lost his mate, apparently to a predator, on her Winslow Pool nesting island in 1988. Trumpeter swans pair for life, but if a mate is killed, they often will look for a new companion. Solo has lured in several new prospects over the years, but they did not produce young until last year.